For some months now, controversy has been brewing over several homeless encampments under Lake Shore Drive viaducts. As the temperatures drop, advocates are even more concerned about the people living there. Over the weekend, when we not only had temperatures below zero but also a few inches of snow, there were about 38 people living under the four viaducts on the north end of Lake Shore Drive. That’s a relatively low number. A lot of people probably found places to stay indoors for the weekend. Homeless advocates say it’s normally closer to 75. These tents are under Lake Shore Drive at Wilson, Lawrence and Foster avenues and Irving Park Road. To keep warm, the folks there are layering up. Someone donated a tall industrial outdoor heater – like the ones you see at restaurants – and a few even have small propane heaters. 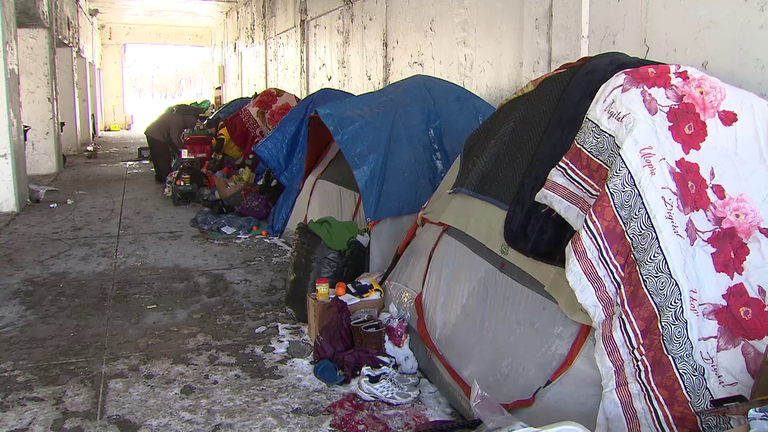 One resident who’s been living under the viaducts for nine months says a shelter isn’t an option for everyone, and the tents, while they provide little protection, are better than nothing. “We’ve got to stay in ‘em because that’s the only shelter we have. We can’t sleep on the outside because wind chill factor drops to 30, the bone will freeze in 99 seconds,” said Louis Jones. Shelters are typically at 95 percent full. Over the weekend when the weather has been atypically cold, that figure increased to about 99 percent. When several dozen people are living in these spaces, without access to running water or restrooms, lots of trash and waste can accumulate. So the city plans cleanings every other week. This is a huge inconvenience for the folks living there because they have to pick up their tents and all of their belongings, including whatever donated food, shoes, water and blankets they have. But when temperatures are this cold, advocates are more concerned than usual, because to do all of that in this cold can be dangerous. The city does have to give the residents a week’s notice (see photo above), but advocates say the frequent cleanings have, in some cases, amounted to harassment. “Treat people with dignity and respect,” said Doug Schenkelberg of the Chicago Coalition for the Homeless. “It’s not to say that cleanings can never happen … but to really balance the needs of these individuals and the reality that they’re living in, with whether or not cleaning should be done. The city says while they can’t stop the cleanings, they have agreed to not use power washers, so the area isn’t wet after the cleaning, when residents move back in with their tents and belongings. In April, the city started a pilot program to house the chronically homeless living in this area. That program was able to get about 60 people off the street and into permanent housing. They’re still working on about 15 more folks from that original group of 75. Department of Family and Support Services Commissioner Lisa Morrison Butler says her department has taken some lessons from a similar program to house homeless veterans, and they may be ready for the next step in finding housing for the chronically homeless. “I think that we feel, as a department, that we have done enough pilots, and with the mayor’s support now we’re ready to take some of those lessons and expand them system wide,” said Butler. And the Northside Housing Shelter, located in the Preston Bradley Center on Lawrence Avenue, is slated to close at the end of this week. Advocates are concerned some of those folks will end up joining the tent encampments when that happens. A word about donations: Some of the folks under the Lawrence Avenue viaduct tell us they’ve received so many donations over the weekend, they now have more than they can use – some food and water freezes. The city suggests donating to shelters and nonprofits, and allowing them to distribute goods. At the same time, advocates don’t oppose giving donations directly to the homeless, but recognizes the folks in the encampments may have received a lot of support lately because of the news coverage. Oct. 10: A pilot program announced last week by Mayor Rahm Emanuel and the Department of Family and Support Services aims to provide temporary employment opportunities and assistance to 100 homeless individuals. Aug. 1: Inspiration Kitchens had been a fixture of the Uptown neighborhood for 11 years. But owners of the restaurant say a loss of federal funding and the state's historic budget impasse made it difficult to maintain a financial foothold. Feb. 24: A coalition of homeless service providers who pleaded with Gov. Bruce Rauner on Friday to unlock $310 million worth of state funding say they will likely only get a small part of their wish.